Whether it is dreaming of the mystifying heavenly bodies looming above, experiencing otherworldly terrain here on Earth, or revealing the inner demons hiding deep within oneself, seeking the undiscovered is not for the faint of heart. Delving into those varying degrees of the unexplored, a lone traveler embarks on a quest accompanied only by her motorcycle and imagination. This terrestrial rocketeer will look, listen, and touch in order to obtain a more profound perspective on her place in the universe as she embarks on a personal adventure into the unknown. Carving through the utter darkness aboard my earthbound craft, I detect only the glittering freckles populating the black canvas above and the rolling pavement streaking below. No city lights or headlights impede my perception of the world as it rapidly flashes by. Though more of a soul ship, my motorcycle is a rocket granting me freedom to navigate through the mysterious landscapes, becoming one with the elements as they whoosh past me. My eyes focus their gaze on the path ahead as my mind ponders the uncharted far beyond the planet’s gravitational embrace. A theoretical physicist born precisely 300 years after Galileo’s death and about 75 years before my terrestrial exploration advised, “Remember to look up at the stars and not down at your feet. Try to make sense of what you see and wonder about what makes the universe exist. Be curious.” I will take Stephen Hawking’s guidance and look up. However, what if someone was looking down on Earth on July 16th, 1945? If anything happened to be meandering through the Milky Way on that day, there is a chance it might have witnessed a deadly mushroom cloud emanating from the world’s first atomic bomb detonation, a sort of calling card to the rest of the Universe announcing our presence unlike anything prior had. As I ride past the White Sands Missile Range, where the initial A-bomb reared its ugly head, I question how this event impacted the space far beyond our current scope of cosmic knowledge and the unforeseen consequences it had or still has. While we are looking up and pondering, maybe someone or something is looking down and cautiously observing. After several hours on the road with my head getting lost in space-dweller dreams, I finally dock my motorcycle in the midst of soaring sand drifts glistening so brilliantly I am nearly blinded by the radiant fragments. 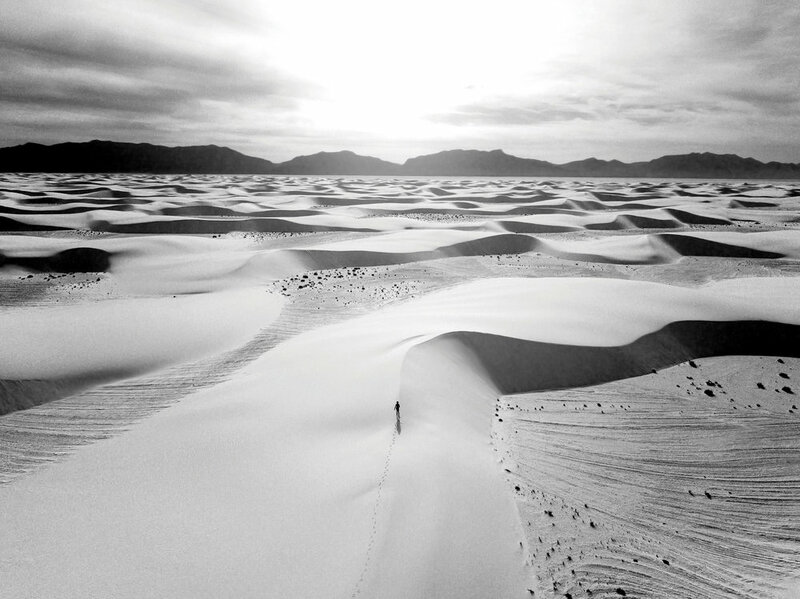 I can see endless dunes luring me with the seduction of isolation; for miles upon miles, Iam the lone explorer. My footsteps are the only thing disrupting the blank white canvas ahead of me as I venture outward to investigate what other terrestrial life forms this sandy region might host. Aside from a scurrying beetle and an erratic lizard making its way up the rippled slope, I am alone. Whether on the motorcycle or secluded in solidarity amongst a blizzard of sand, I am confronted with what I see and what I think; there is no running from my environment or myself. I am forced to look. Or maybe it is those things we simply cannot view that should secure a greater portion of our attention. The unobservable corners of our universe, black holes, dark matter, gravity, parallel universes, and our deeply buried thoughts are all just waiting to be observed; our eyes are not the only apparatus with which to see. It is time to board my motorcycle before these dunes and my thoughts swallow me whole. Have you ever experienced a silence so potent that it is nearly deafening? I am adrift somewhere in the New Mexico desert feeling overwhelmed by the eerily quiet backdrop as the sun begins its breathtaking farewell dance over the horizon. Helmet and bike off, I listen for any signs of life other than my own biological pulses that quicken the more I acknowledge my desolation. Back on my motorcycle, the only heartbeat I discern other than my own emanates from the four-stroke flat twin engine rhythmically animating my energetic vessel; her gentle roar provides comfort and grants the illusion that I am not entirely alone. I admit that it would be challenging to feel true confinement in the broader extension, even as a solo seeker in an empty desert, when there are more than 7.5 billion Homo sapiens swarming planet Earth. However, imagining we are the only intelligent life form in an endless universe can be somewhat of a disconcerting contemplation. Unwilling to accept such a lonely thought, our species continually searches for any possible signs of life hiding among the myriad nameless stars. One way we theorize to accomplish this is to listen. Disrupting the constant form of the vast San Agustin landscape is the impressive sight of the National Radio Astronomy Observatory’s Very Large Array (VLA), our ginormous ear to the cosmos. I feel infinitely small as I ride up to the spread of 27 radio antennas, each reaching 82 feet in diameter. Utilized by astronomers worldwide for varying objectives, the VLA’s massive structures work together to simulate the resolution of a single antenna stretching 22 miles across. This satellite array acts as one of our most powerful tools for listening to the songs of our solar system. I circle around the observatory on my motorcycle to take in the full breadth of the incredible arrangement. The antennae are aligned identically and periodically shifting in unison; I speculate about which point they are fixated on in the universe. They could be observing remnants from a supernova, mapping out a potential black hole, or monitoring gamma ray bursts. Maybe the Search for Extraterrestrial Intelligence (SETI) is taking over this evening in hopes of identifying radio waves sent from intelligent life forms located billions of light years away; whether they are or not, I am certainly glad someone is listening. With spring is still in its infancy, the stubborn winter cold has not yet surrendered its icy grip. I feel the cold air viciously biting at any exposed skin it can sink its teeth into. I am grateful for the ATWYLD Voyager Suit accompanying me on this adventure, triumphantly shielding me from this harsh environment. Though I am riding on the edge of my comfort zone, the morning’s icy touch cannot thwart my personal voyage into the unknown. Although I was born nearly three decades after the launch of Sputnik, I am still touched by the era that kidnapped the world’s imagination and dared people to dream about the mysteries that lurk beyond our own skies. Saturated in danger and uncertainty but also optimism and pride, almost a half-century ago we launched ourselves into the great Space Age. I often fantasize about time traveling back to July 20, 1969, and eagerly watching Neil Armstrong and Buzz Aldrin proudly sporting their cumbersome spacesuits ­— a thin veil cushioning them from the severe conditions in space – as Apollo 11 approaches the patient moon awaiting human contact. These courageous astronauts were fully aware of the risks and were willing to give their lives to pursue going where no human had gone before. Arguably one of the most compelling moments of the 20th century, our connection with the moon was not only significant for having physically touched the lunar surface, but also for the way it touched the hearts and souls of the millions breathlessly watching as Armstrong took his first steps across the cosmically scarred surface. If we can sail humans to our closest celestial body, it is not so farfetched to envision landing a person on the Red Planet in the not-too-distant future. I feel a distinct flutter of excitement as I approach a hidden gem. The Paint Mines Interpretive Park is what I imagine the surface of Mars might look like ­— dry, barren, rocky and undeniably beautiful. As I lightly graze the chalky clay, I pretend I am an astronaut exploring our neighboring planet for the first time. Searching for signs of alien life, I could almost envision strange Martians hiding in the endless cracks and crevices weaving through the rocks. Though we currently have robots collecting data on the surface of the Red Planet, we are expecting to send humans to Mars around 2030. Maybe I do not have to yearn for a time machine to transport me back to the golden era of the Space Age, when I can just patiently wait for the next chapter of groundbreaking space exploration. As we continue to expand our boundaries into the unknown, I wonder what sorts of mysteries we will solve or conceive. As I take off from these Mars-like grounds, I am in awe of the distance brave humans have traveled and will travel to make physical contact with far-off celestial bodies. I am equally impressed with the enthusiasm we have exhibited in support of such lofty endeavors – a testament to the innate desire most of us have to explore and understand more about the great mystery that is the Universe.